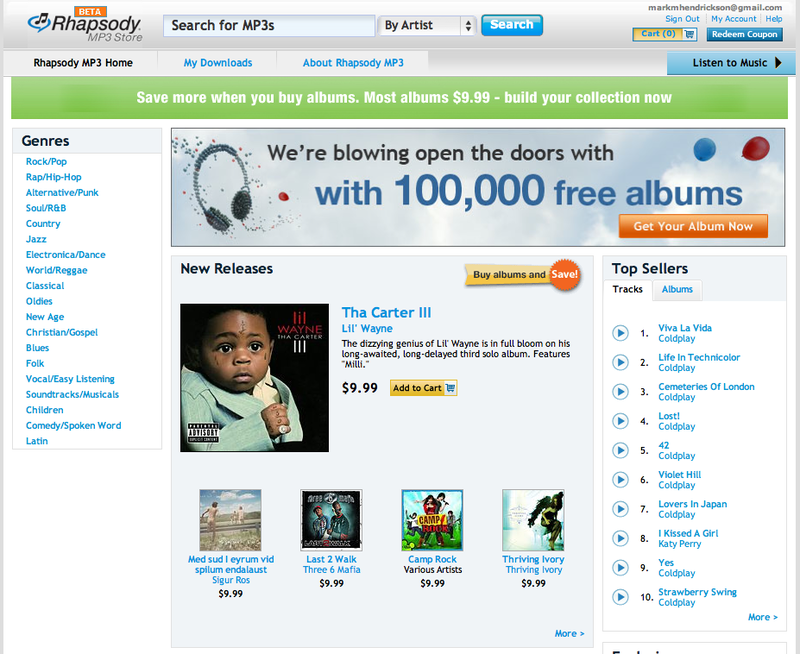 Streaming music service Rhapsody has joined the likes of Wal-Mart, Amazon, and Napster by launching an MP3 store. Its move to offer unprotected music downloads has been anticipated since last Fall when Real Networks joined forces with MTV and Verizon. The Rhapsody MP3 Store offers music from all four major labels (Universal Music Group, Sony BMG, Warner Music Group, and EMI) at 99 cents per single and mostly $9.99 per single disc album. While Rhapsody specializes in streaming music to paying subscribers ($13 per month gives you on-demand access to its entire music collection), this is not the first time Rhapsody has offered downloads. Most of its downloads have been protected by RAX-formatted DRM, although lately MP3 files have been mixed into its collection as well. But with the launch of its MP3 store, Rhapsody fully endorses the idea that DRM is dead. And it goes toe-to-toe with the aforementioned DRM-free music stores, as well as iTunes Plus (whose files are actually in AAC format, not MP3), by providing over 5 million tracks that can play on virtually any music player without any restrictions. All songs will be provided with a 256 bit rate. The Rhapsody MP3 Store sits to the side of the regular Rhapsody streaming music service on its own subdomain, but the two are also integrated with one another. Shoppers on the MP3 store site who are also paying subscribers can play full-length samples (non-subscribers can also play up to 25 full length samples per month). And subscribers have the option of buying and downloading the files they’ve enjoyed streaming but want to play when not at their computers (or connected to the internet). The purchase experience is mostly browser-based; however, Rhapsody also provides a download manager that can automatically load songs into iTunes. Only Windows is supported at launch, with Mac support coming later. Rhapsody is also working over the next couple of months to integrate its streaming and downloading functionality into Viacom’s network of music sites, including MTV, VH1, and CMT. It has teamed up with iLike as well to power music across all of that startup’s social networking apps and on its main website. Expect the same level of integration that we’ve already seen on MOG. On related notes, Rhapsody is putting the finishing touches on its powering of Yahoo Music, which should go live soon so that Yahoo users aren’t simply redirected off-site. And it has just helped launch a new Verizon VCAST music service for getting its songs onto mobile handsets. With all of these partnerships, Rhapsody is working to become not only a destination but a platform for music distribution as well. Streaming music may be the way of the future – especially when reliable and fast wireless technology becomes ubiquitous – but the launch of Rhapsody’s MP3 store goes to show that consumers still want to own their music – and control when and where they can use it. Also see our round up of DRM-free music providers from last fall, which includes some of the more indie-focused services like Amie Street.